Sometimes a picture really is worth a thousand words… but if you have a bird phobia, you need to know that this page has several photos of birds, which you may find triggering. In July 2012, Alison and I got together to work on her bird phobia. Her fear was so debilitating that even the sound of someone rustling a newspaper or the sideways glimpse of a skirt flapping in the the breeze would send her cowering in fear. Her particular terror was that a bird would get caught in her hair, and avoiding places where birds might be near her was limiting life to a significant degree. No coffees with friends at pavement cafes in summer, no days at the beach or walks along the river and definitely no picnics! Even the sight of a feather was distressing. Eventually, she decided enough was enough and after contacting me through Birdworld, she booked her session. 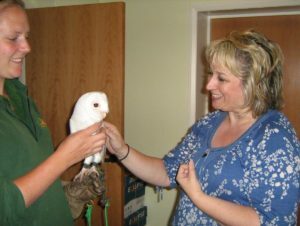 After a couple of hours of gentle work, she felt OK to meet Whisper (and Lizzy Perrett, then Head of Education at Birdworld). Later, she walked around Birdworld, enjoying no longer feeling afraid. 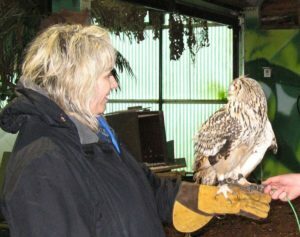 Some months later, we met at Birdworld again and she did just that – this is Alison making friends with Mozart, a very special owl. 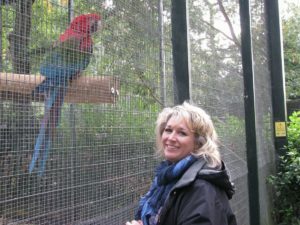 People with a bird phobia often cannot even bear to look at photos of birds, so I don’t expect a sufferer to have read this far – but if you know someone who has had enough of feeling afraid, please do suggest they contact me here to find out more about the work I do to help free up people just like them. You’ll be doing them a great kindness.